Sharp's AQUOS BOARD® PN-L703W is designed for smooth and effortless communication in a wide range of contexts. The PN-L703W includes built-in wireless connectivity that enables different devices to connect easily. Information from those devices can be displayed in a 2 x 2 split screen, allowing for highly productive interactions. Using SHARP Touch Viewer™ software, you can manipulate various file types in the same work area. The pen digitizer function, meanwhile, distinguishes between pen and finger input and supports natural and seamless operation. 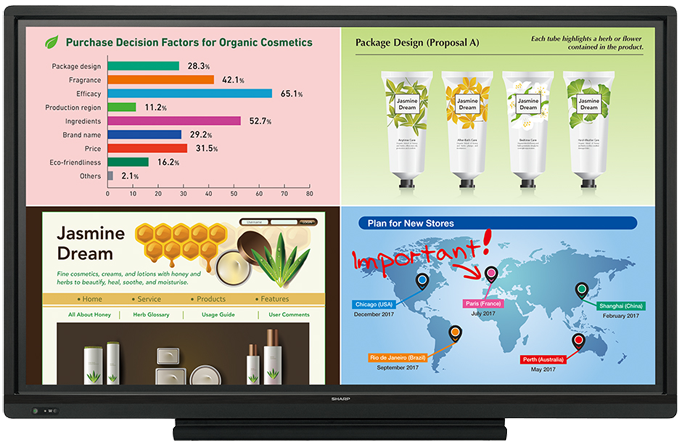 These and other superb AQUOS BOARD features are sure to boost creativity and participation levels in presentations and small-scale meetings, while fulfilling the growing demand for cable-free collaboration.